A European observatory will announce what it describes as "major" alien planet findings on Today (Sept. 12). The European Southern Observatory (ESO) will hold a press conference at 10 a.m. EDT (1400 GMT) Monday to "report significant new results in the field of exoplanets," ESO officials said in a media alert. Kissler-Patig or Liske will discuss the future of exoplanet research with ESO's European Extremely Large Telescope, ESO officials said. This instrument will be the world's largest telescope, boasting a 129-foot (39.3-meter) main mirror. 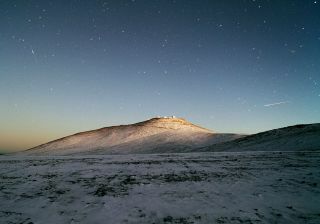 It will be built on Chile's Cerro Armazones mountain, and could begin operations by early in the next decade. ESO didn't give any further details about what Pepe and Kaltenegger will discuss. Both scientists are actively involved in the search for potentially habitable alien planets — those on which liquid water, and perhaps life as we know it, could exist. According to NASA's Jet Propulsion Laboratory, astronomers have discovered 564 confirmed alien planets to date, with more than 1,000 more candidate worlds suggested by data from the Kepler space observatory.